Intro: Peter Moscon is the son of “Red” Moscon. Peter’s dad was a larger-than-life character for many of us who grew up in Glenwood Springs, in the ’50s and ’60s. He influenced our lives by the way he moved through his. 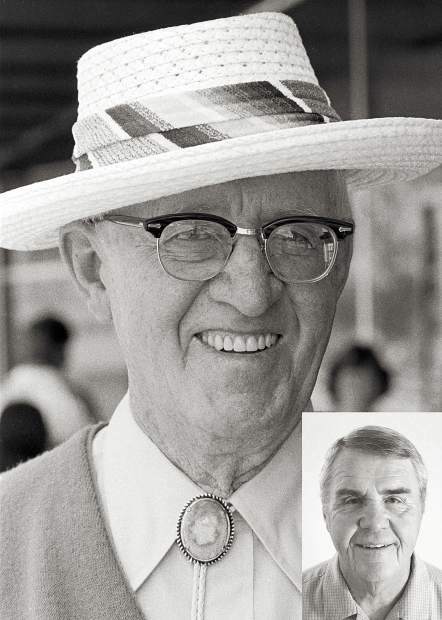 “Red” spent much of his career working in retail, selling clothing at Napier’s and Bullock’s department stores, selling cars and managing a full-service gas station across the street from the Hotel Colorado, back when cross-country travel was beginning in earnest. He was a consummate salesman but, more importantly, he was a town father who took the time to really see all of us kids and our potential. Moscon: My grandfather was born in Austria in 1857 and left at age 14 when the Austrian army decided they wanted him to join. He chose to leave instead and headed off to Germany where he apprenticed as a stonemason and bricklayer. He spent some time in France before eventually coming to the United States. He made his way to Pennsylvania where he got a job working in the mines doing brickwork but the mines in Colorado were beginning to boom, and it wasn’t long before he made his way west to Glenwood Springs. My dad said that Granddad did a lot of the brickwork on the coke ovens at Cardiff just outside of Glenwood. He eventually got work in the coalmines and got married. My grandparents’ first child was born in Sunlight in 1888. My father was born in 1902 in Spring Gulch. There were a number of coal camp towns at that time — Sunlight, Spring Gulch, Marion and South Canyon. In the middle ’70s, I took my father back to the Spring Gulch town site, and he was able to help me visualize the town and the streets where he played as a kid. My father’s name was Arthur John Moscon. He was never known as that. He was always known as “Red.” He was born in 1902, the third youngest of 10 children, eight survived. Life wasn’t easy back then, but my dad was always able to make the best of what he had. He knew how to have a good time. My grandmother was a very strong person in her own right, and my dad told a story about the time she put her foot down. My grandfather had heard that there were good jobs for masons working on the World’s Fair in St. Louis in 1904. He wanted to load up the family and head east, and my grandmother was having none of it. Spring Gulch reminded her of her home in the mountains near Bolzano, Italy, and she wasn’t about to move. So they ended up buying 10 acres in West Glenwood from Walter Devereux*. My father told me that they had scrimped and saved over the years and hid their money under the floorboards of their house in Spring Gulch until they had enough to buy their way out of the mine. My grandfather continued to work in the mines and spend his weekends building their two-story house and outbuildings. They moved onto their land when my dad was 8 and planted fruit trees and a huge garden. After a few years, they were producing enough vegetables to sell in town. They had apples, cherries, lettuce, squash, potatoes and strawberries. They even won a prize at Strawberry Days, one year, for the biggest and best strawberries. My dad’s first job, which he remembered fondly, was to hitch up the horse and haul produce to town and sell door-to-door off the back of the wagon. He and his older brother would start in Poverty Gulch and go up and down the streets. Gallacher: Where was Poverty Gulch? Moscon: It was at the end of Seventh Street, right at the mouth of Glenwood Canyon. That was where the houses of prostitution were in those days, and dad told stories of the women coming out to buy produce. Gallacher: That must have been quite an adventure for these two young boys. Moscon: I don’t think they ever complained about going to town. Dad remembered these ladies as always treating them with kindness and respect. He said whenever he saw them downtown they were “dressed to the nines.” They presented themselves very well. It was a very different time then. My grandfather would dress up on Saturday night and go downtown and play cards with the guys. He would drink a little beer and tell stories with his friends while the kids stayed home with Grandma. Gallacher: Yeah, that was the old days. How old was your dad when he got married? Moscon: He didn’t get married until he was 36. Like so many kids back then, he was needed at home to help bring in extra income and keep the family viable. He was bright enough, in school, but higher education wasn’t an option for him and the family. He quit and went to work when he was a sophomore in high school. Gallacher: So what did he do? Moscon: He worked as a laborer and helped my parents on their farm for about five years, and then he became a salesman. He had learned some of his skills on the back of that vegetable wagon, early on, but some were genetic. He was a born entertainer. He loved people and could talk to just about anyone. So, in his 20s, he went to work at Napier’s Department store. The Napiers were wealthy, by Glenwood’s standards, and their son and my dad became good friends. I think my dad was quite a partier in his 20s. He loved to dance, and the Napiers had a dance floor in their house. He once won a ballroom dancing contest at the Hotel Colorado and got a $5 gold piece. I still have it. During Prohibition, he and young Napier would get off work in the afternoon and make a run to Leadville for some moonshine. I’m not sure why they felt they had to go that far, but that’s what they did. Gallacher: That must have been a treacherous drive in those days. Moscon: Yeah, dirt roads, mud and bad headlights. Dad said he was always the one who drove while the others drank. They often got home just in time to go to work. That job didn’t end particularly well. I think Napier’s mom thought my dad was a bad influence, even though Napier was older. My mom always said that Dad couldn’t hold his liquor, and I think, if he had been drinking a lot, they all would have ended up dead on one of those midnight Leadville runs. Gallacher: How did your mom and dad get together? Moscon: My mother was a nurse at the hospital (second and third floor of what is now the CMC administrative building at eighth and Grand). They met after a tragic shooting in Glenwood. William Noonan, a local attorney, had been feuding with Harvey Taylor for months. Taylor was a laborer in town, his wife Mary was Noonan’s housekeeper, and his daughter, Cecel, was Noonan’s secretary. Taylor felt Noonan was making unreasonable demands on his wife and suspected he was taking advantage of his daughter. The two men traded threats until Taylor made good on his. Taylor was sitting in front of the livery stable, on the corner of Eighth and Colorado, when Noonan got out of his car and started across the street to his law office (second floor of the Noonan building). Taylor shot him once in the stomach and followed him, as he staggered across the street, and shot him eight more times. My mom was on duty at the hospital that day, and Noonan was alive when they brought him in. They struggled for hours to save him, but Noonan died that afternoon. After work, she stopped at the drugstore across the street for something to drink, and in walks my dad, and the rest is history. They started going together and got married pretty soon after that. Gallacher: What was their relationship like? Moscon: I guess I would characterize it as “us against the world.” I think a lot of people told them that they weren’t going to make it. My father was Catholic, and my mother’s family didn’t want her to marry him. Her dad refused to walk her down the aisle and never did accept my dad. It was rough in those days. My dad told me stories about the Ku Klux Klan burning crosses and intimidating Catholics and Italian immigrants. They didn’t have it easy, but they made the best of the situation and still managed to have fun together. They were inseparable in life and in death. They died within a month of each other. They cared for one another very well. *(on page A5) Walter Devereux became the manager of the Aspen Smelting Co. in 1883. He later designed a hydroelectric plant to power Aspen mines and was an organizer of the Grand River Coal and Coke Co. In 1888, he brought hydroelectric power to Glenwood Springs, completed the municipal water works, and developed the hot springs pool. His projects in the 1890s included the construction of the Hot Springs Bathhouse, the Hotel Colorado and the Vapor Caves.